It was the Romans who first made Bath famous. One day they discovered that hot water was pouring forth from somewhere deep below the earth's surface. "Lo!" they probably said. Or maybe "hark!" Most likely it was something in Latin. Actually, it’s more accurate to say that the Romans rediscovered the natural springs because eons before the Romans came tromping into town the area had been a Celtic shrine, dedicated to the Celtic goddess, Sulis. And actually, it wasn’t the Celts who "discovered" the springs either. Archaeological evidence shows that there was human activity around the hot springs at least 8,000 years B.C. So that’s that. We have no idea who discovered the springs. 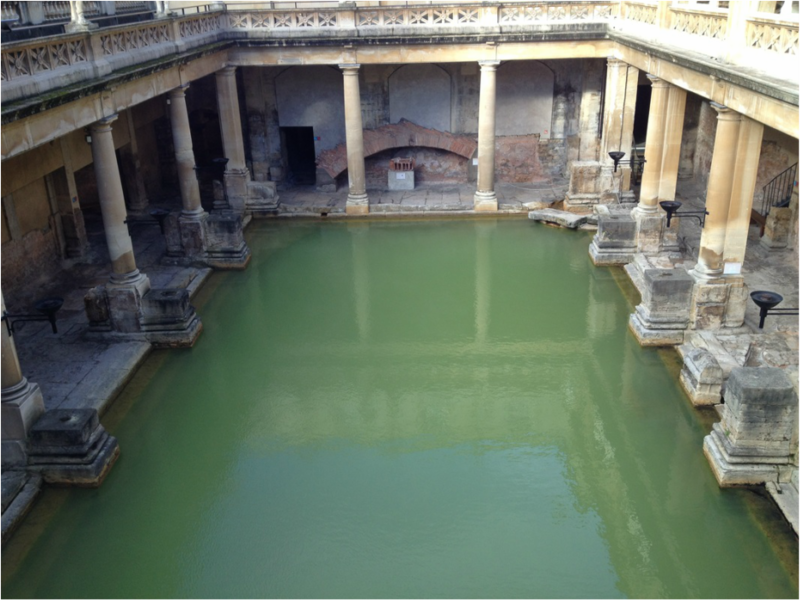 At any rate, the Romans created a settlement known as Aquae Sulis, which is Latin for "the waters of Sulis." Over time, as the Roman Empire was stretched to it’s limit, troops were gradually pulled out of Britain to handle emergencies (like, for example, their entire empire crumbling) elsewhere. By 450 England was no longer part of the Roman Empire. A bunch of history stuff happened, and lo! it was the 1700s. ﻿In 1707 Dr. William Oliver published a fun read called Practical Dissertation on Bath Water. Oliver highly recommended both drinking and bathing in the natural spring water, insisting that the waters would cure a long list of diseases, including the very popular gout. When royal people, like Queen Anne, started taking the waters at Bath, a tourist attraction was born. Postcards boomed. T-shirts took over. Timeshare was invented. ​I love that the townspeople posted this sign at the top of the bridge. ​Because you know they didn't put it up before some fool tried it. ​Walk the path below the bridge and peek into the windows of the canal boats. See how canal-boaters live. The thirty houses of the Royal Crescent were built by John Wood, the son, between 1767 and 1775. 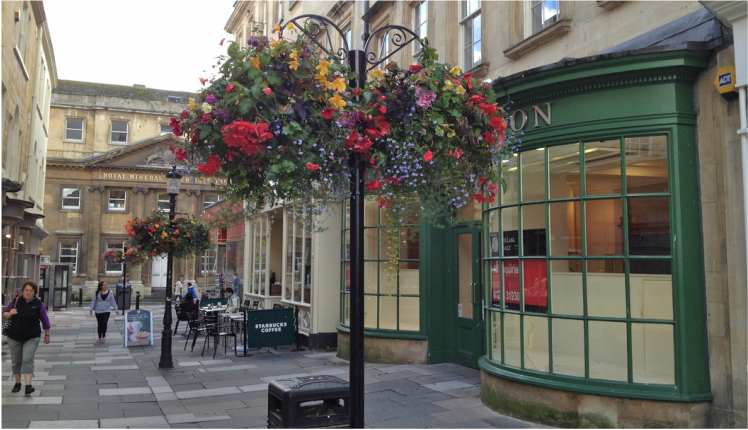 It was a feat of engineering and quickly became the place to live in Bath. 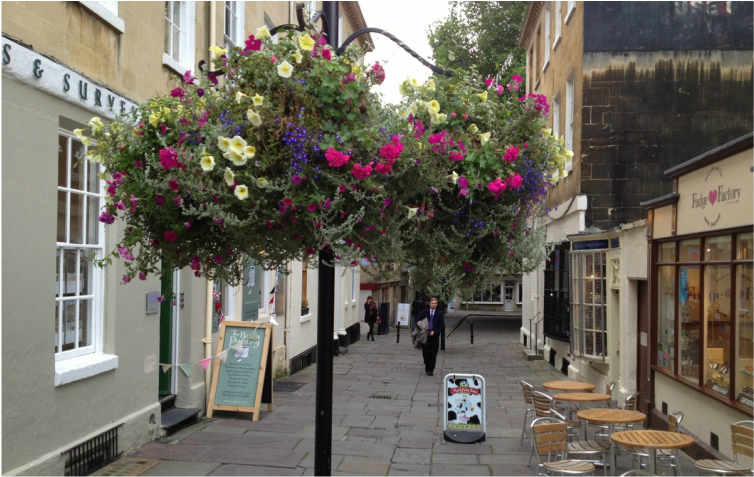 No doubt Jane Austen walked here herself; you don't come to Bath without walking the Crescent. Lots and lots and lots of shops! 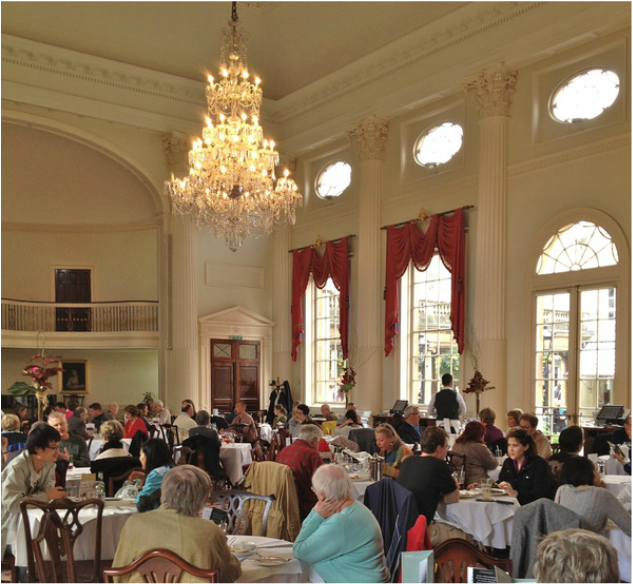 In Jane's day, the Pump Room was empty of almost all furniture, leaving lots of room for people to parade their fine clothing around the room. Today you have to parade from a sitting position.